Who is Naykii? When I was little, friends couldn’t pronounce my name, René, and so I was called Naykii instead (pronounced Nay-key). Today I create a variety of artworks and items through my brand Naykii. Born and raised in South Africa (but calling Australia home since 1996); I currently reside in London, U.K. with my husband Matt, cat Jax and dog Lulu. I create distinct eye-catching designs inspired by nature, travel and everyday experiences. 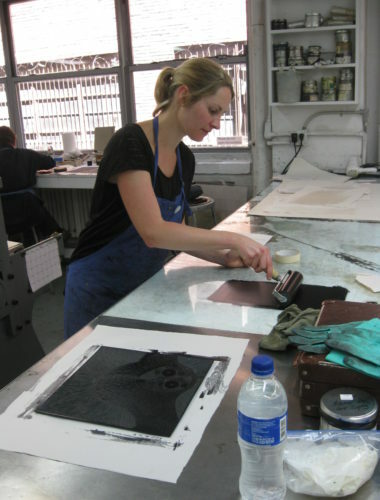 My original, limited edition prints are carved and printed by hand on a press. Some prints are black and white; whilst others have color added with watercolor paint, paper or thread. Rather than discarding trial and imperfect prints I recycle and re-imagine them into one-of-a-kind collages, 3D artworks and other items. More recently I have connected with my inner seamstress; making cushion covers inspired by my collages and prints. They are screen printed with water based ink onto heavyweight 100% cotton fabric with felt, buttons and hand-embroidery adding a special touch. Many of my prints are particularly suited to nurseries, children’s rooms and those young-at-heart. I hope Naykii’s original prints will be treasured and perhaps passed on to the next generation and that other Naykii items become treasured keepsakes. Connect with me on social media for process photos, updates and special promotions.